2010 ACGA Display - Carl & Eunice Booker. This unusual display provided by Carl and Eunice Booker caught our attention because of the four accompanying pieces which are mindful of the ABC and Bo-Peep plates known to have been produced by Westmoreland. The Bookers agreed to send photos and comments in order that viewers might take note and perhaps help place these unusual plates/bowls in proper perspective. The statements appearing under each photo of Tulips, Bouquet, Cobblestones and File were provided by Carl and Eunice. We have placed them in the realm of Westmoreland manufacture since they have all the (bells and whistles), earmarks of other confirmed patterns from that maker. Should anyone have old factory catalogs illustrating these designs, we should all be most happy to hear from you! 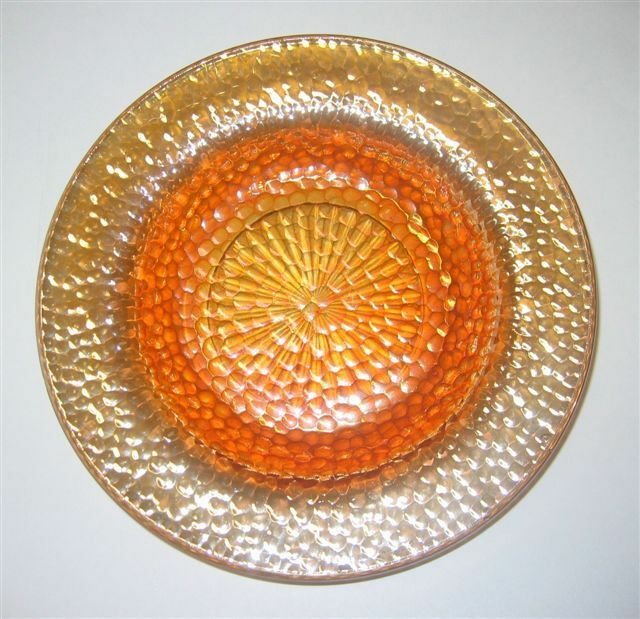 This TULIPS Baby Plate measures 7 ½” across, has a 5 3/8” base, and is 1 1/8” deep. The lip is 1 3/8”. We named it Tulips, but it could have been named Elephant Parade. It has a multi-starred base and appears to be the same size and shape as the ABC Stork plate. This is the only plate in this pattern that we’ve seen. You may see an example of this 7 ½” ABC STORK Plate by going to our (Westmoreland – Part 4) segment. That plate was advertised in a 1927 Butler Brothers Wholesale Catalog. 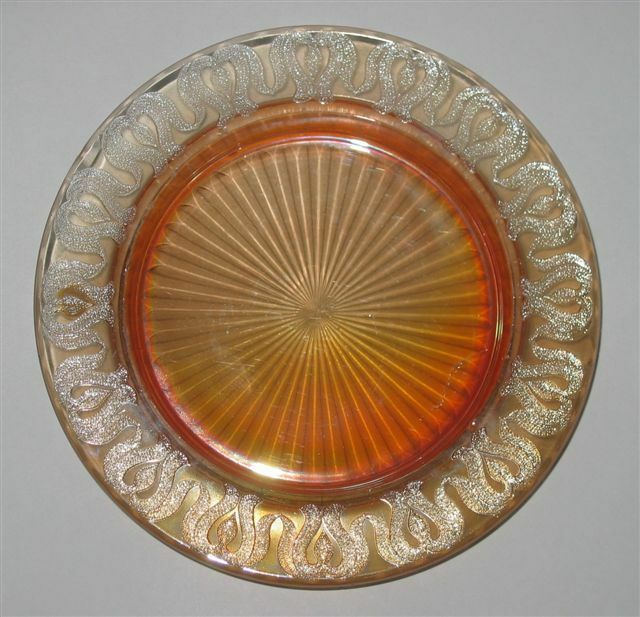 An example of the 7 ½” BO-PEEP plate can be seen our (Westmoreland – Part 3) segment. 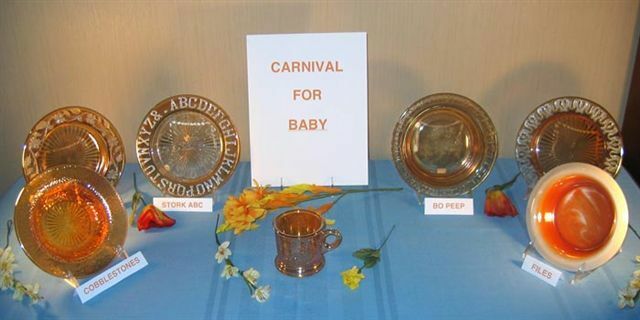 This plate appears to be from the same maker as the ABC Stork and the Tulips plates. It measures 7 ½” across, has a 5 3/8” base, is 1 1/8” deep, with a 1 3/16” lip. 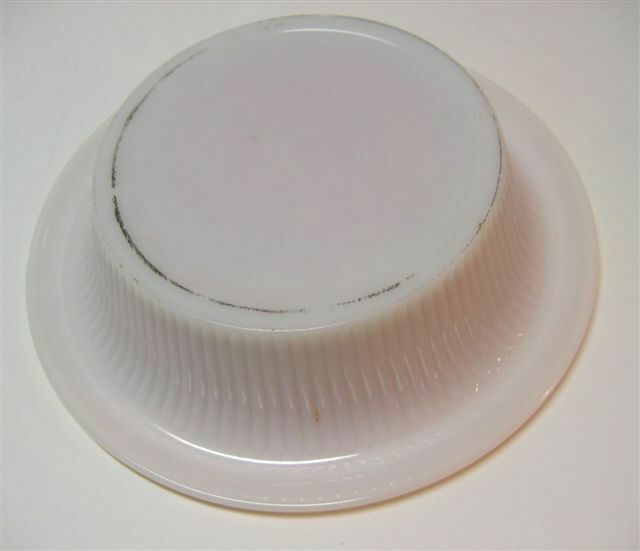 It has a plain exterior and a starred base. We have always called it Baby BOUQUET Plate. I thought we had found the pattern in the Presznick books, but looking again, I couldn’t find it. I did not find it or the Tulips plate in any of the Hartung books either. Isn’t this a fun hobby?? This FILE Baby Plate (named by us) measures 6 5/8” across, has a 4 ¼” base, is 1 3/8” deep, and has a ¾” lip. It appears to be marigold on milk glass. It has a plain interior and exterior except for the “file” pattern on the side of the exterior; thus the name. The base is plain. We do not know the maker. This is the only one of these baby plates that we’ve seen. DAISY SQUARES - interesting shape in amethyst. 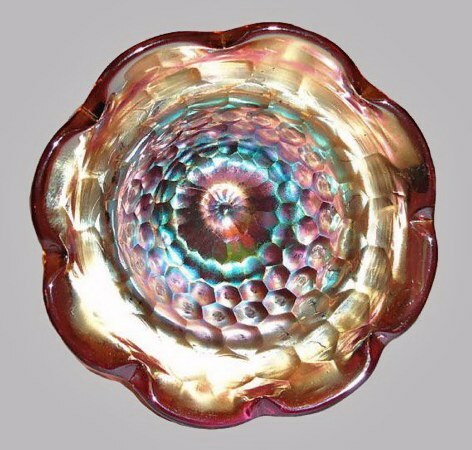 Left - Iridized interior of Amethyst DAISY SQUARES Compote. 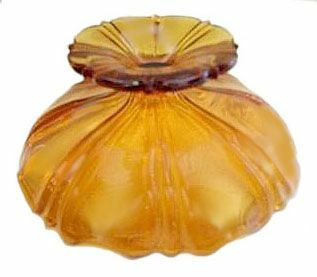 Right - Amethyst DAISY SQUARES Compote. DAISY SQUARES Compote: These three photos of two different amethyst compotes offer the wide variation found in much of the work from Westmoreland. Complexity of design/pattern, but the iridization can be anything from a (one to ten), so to speak. 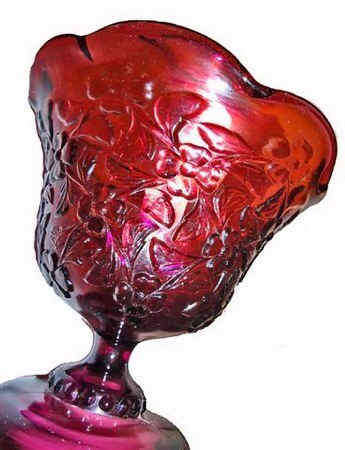 Perhaps that factor is the reason few examples of Westmoreland carnival glass appear in most collections? 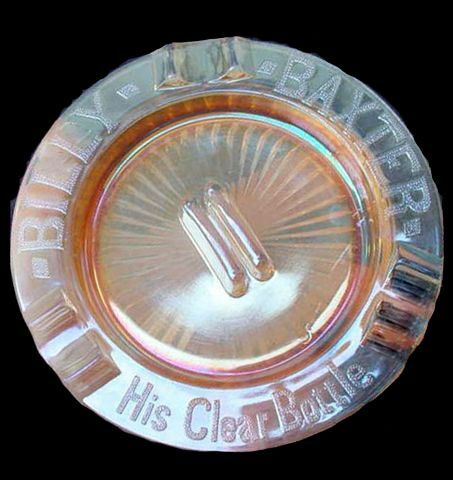 Just a thought………..
BILLY BAXTER - His Clear Bottle-5.75 in. diameter. BILLY BAXTER Ashtray: We can find no direct attribution as to a producer of this piece while searching earlier written accounts such as Hartung. It is from comparison study that we place the manufacturer in the hands of Westmoreland. It has the same overall characteristic of the Bo-Peep and ABC plates. Since the ABC Stork plate was advertised in a 1927 Butler Bros. Wholesale Catalog, we believe that this ashtray may have been made during that same timeframe, possibly extending on into the 1930s Depression era. 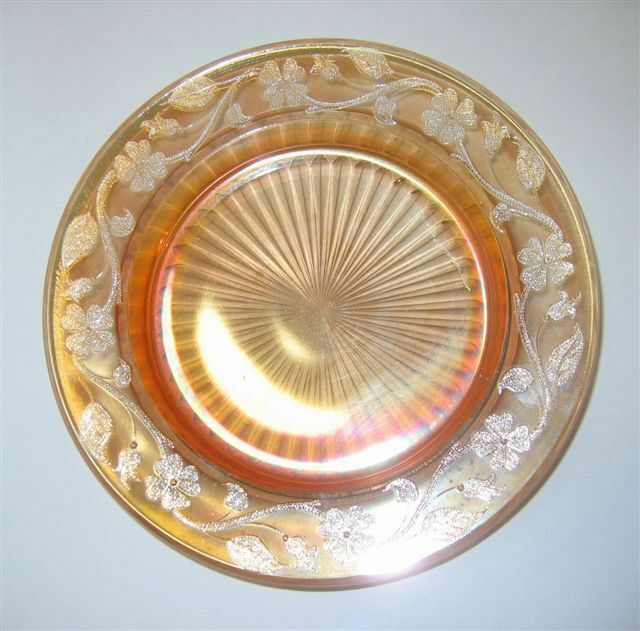 It’s interesting that this ashtray does not appear in auction price results…………..come to think: we never see one listed on an auction brochure! Westmoreland gave this pattern the number 252. 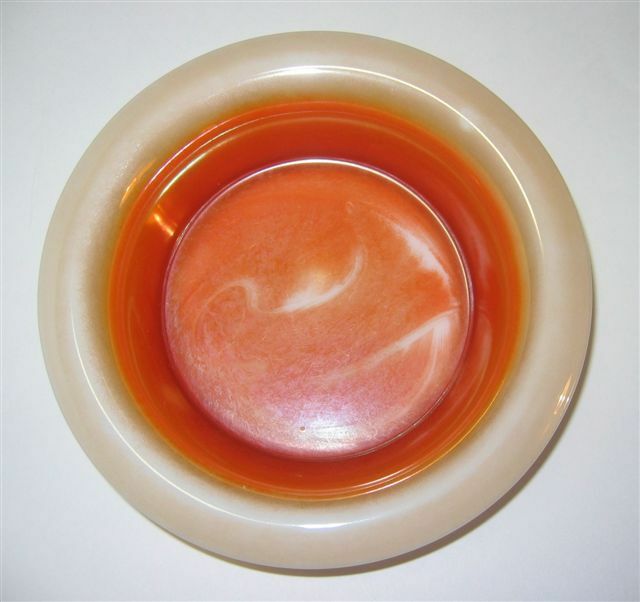 TWO-SEVENTY COMPOTE: Here’s another item which receives little attention. 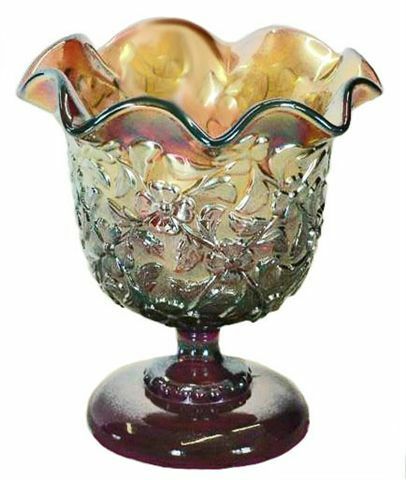 Auction after auction passes without notice of this compote in any of its colors. Marigold over Milk glass, amethyst, peach opal, pearlized blue over milk glass (Persian blue is reserved for 4 patterns produced by Fenton), aqua and now an example in amber. BUTTERFLY- Courtesy Jerry & Carol Curtis. 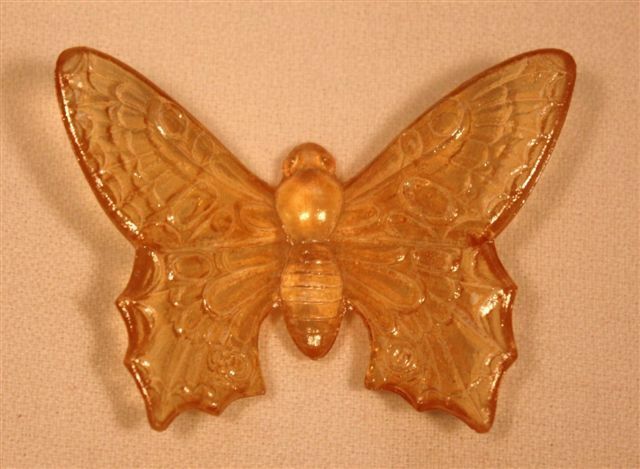 BUTTERFLY: This Westmoreland example is quite different from those produced by Fenton. Seen occasionaly in blue, as well as marigold. These ornamental (old) butterflies are not seen all that often. Possibly created as paperweights, perhaps a toll in breakage has narrowed the quantity available? Jerry provided the actual measurements as follow: ¾” wing height, 2 5/16” wing span, 1 ¾” wing front to rear length, 1 1/8” body length. Westmoreland made #1, #2, and #3 butterflies. The one pictured is #2, according to company files. A fool despises his father’s instruction, but he who receives correction is prudent. In the house of the righteous there is much treasure, but in the revenue of the wicked is trouble.